For the love of Viktor & Rolf! Column gowns, ethereal sheath dresses, tulle, handcrafted 3D flower appliqué detailing and dramatic trains make a diverse luxury bridal collection. Dutch duo Viktor Horsting and Rolf Snoeren graduated from the Arnhem Academy of Art and Design in 1992 knowing exactly what they wanted to do with their lives. It took them just a year to launch Maison Viktor & Rolf. Even though they were shunned by the fashion industry at first, the designers were received well by the art world for their unconventional approach to fashion – a provocative and conceptual glamour infused with surreal contrasts. And there is a happy ending to their story. Ever since their first collection for Spring/Summer 1998 during Paris Fashion Week, they have established themselves as a widely recognized and respected design duo of Haute Couture. Twice a year the house of Viktor&Rolf offers a luxury bridal collection that aspires to create spectacular beauty and unexpected elegance by exploring iconic elements inspired by classic couture influences. The ‘Mariage’ collection adheres to the three key Viktor&Rolf pillars: Unexpected Elegance, Conceptual Glamour, and Provocative Couture. This season’s Spring/Summer 2019 collection was surprisingly diverse: There were of course the dramatic, avant-garde and sculptural silhouettes and signature elements like architectural skirts and oversized bows we’ve come to expect. But every look had a fresh, effeminate twist as well –most dresses were embellished with delicate embroideries and an abundance of 3D lily of the valley and flower appliqué motifs that added a softer etheral touch to the designs. There were more surprises: retro mini dresses and even a jumpsuit. Ethereal sheath dress with a crystallised ruffle neckline. The all sheer airy tulle overlay is intricately crafted with tulle flowers and crystals. This dress features a modern slip in a beautiful Japanese crepe with an open neckline with two small bows as a signature detail. Light tulle gown adorned with intricately crafted 3D flowers. Back interest is created through an arrangement of tulle flowers throughout the skirt and along the length of the dramatic train. This gown features a plunging neckline and an open back. Double-faced satin gown with a graphic square cutout neckline and handcrafted 3D flowers cascading down the 3/4 sleeves. Detachable train with bow detailing and 3D flowers cascading down its length. Flattering bias-cut column with capped sleeves. The upper bodice is fully embellished with beaded lily of the valley, which are tied together with a signature graphic bow. Detachable fold-over train. Flirtatious fit and flare crepe gown with a cascade of 3D couture flowers which envelop the shoulder and around the backside of the dress. A beautiful plunging neckline adorns the back. Not surprisingly, throughout the collection there was a lot of the signature Viktor&Rolf sleek draping and beautifully constructed bows. The front of the dress boasts a hidden slit where the wearer’s leg can be subtly revealed. Outstanding draped bow back detailing with an oversized dramatic bow that drapes into a standout asymmetric train. Satin taffeta gown with a dramatic watteau train and plunging v-neckline. 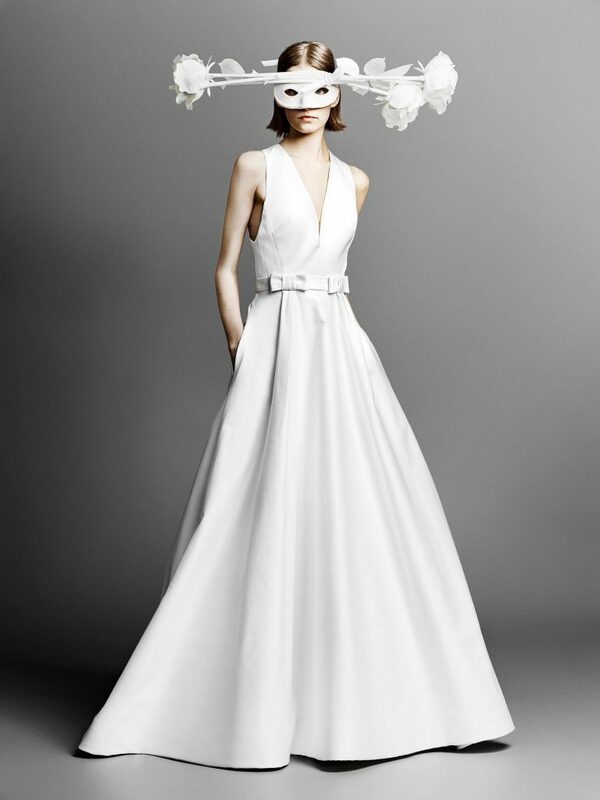 The bow waistband drapes into the voluminous skirt. Flattering fit and flare dress with a high neckline. The dress boasts a band detail on the neck and a signature bow. Elegant and chic, the back of the dress features a low open back with graphic bow detailing. 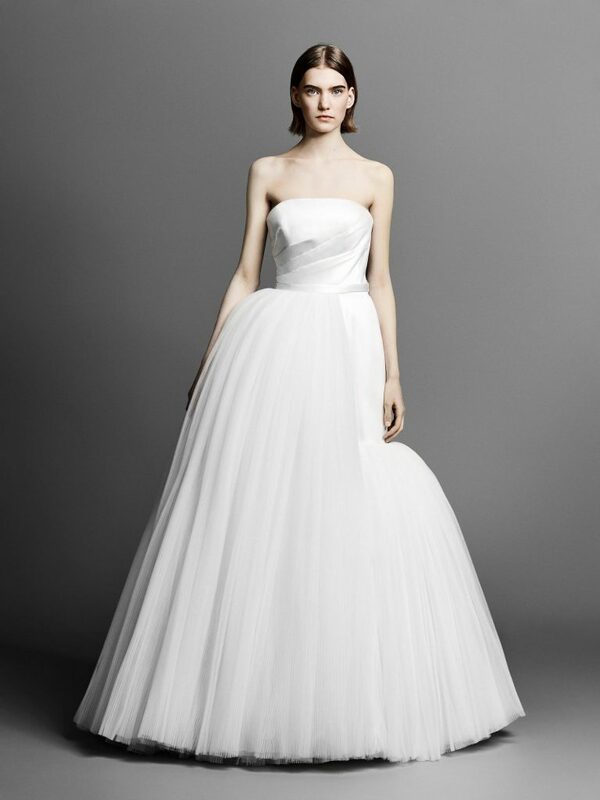 Tulle, another staple of the Mariage collections, is highlighted throughout the collection. A classic Viktor&Rolf design, the draped bodice gives way to a patchwork of volumes in the graphic plissé skirt. 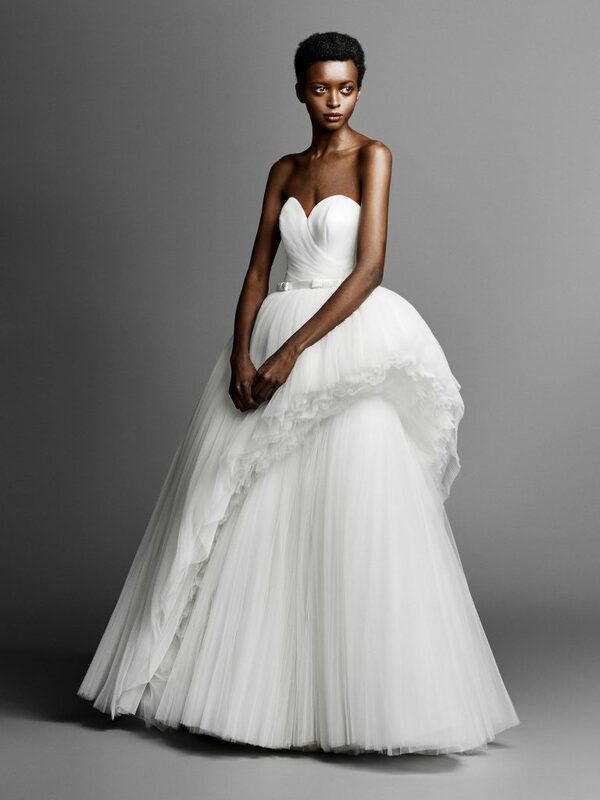 One gown featured a dramatic cut which cascades diagonally along the sculptural body of the skirt transforming the classic tulle ballgown into an outspoken statement piece. Featuring an asymmetric tulle drape in the sweetheart bodice and a small detachable belt with bow detailing. Voluminous gown crafted out of intricate layers of volants utilising various tulle techniques. Open back tulle gown with a halter neck. Flower appliqués cover the front of the bodice and sprinkle down the length of the skirt. Signature bow detailing is integrated on the back of the neck and waist. 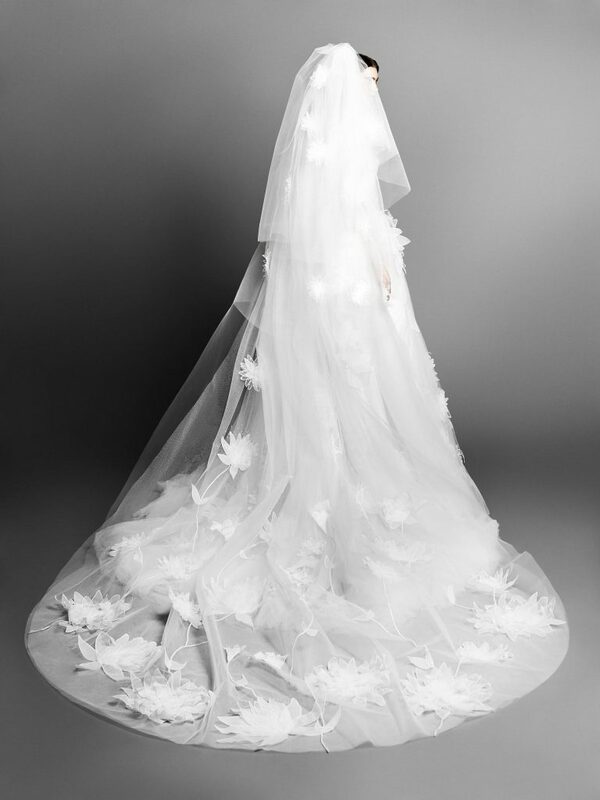 But any Mariage gown would look dreamy combined with the tulle «Lilly Garden Veil» that is decorated with an abundance of flowers and adds an ethereal touch to even the most sculpted dress. Three-tiered tulle cathedral length veil. The collection includes three minidresses that encourage all-night dancing. The Babydoll style «Tulle Patchwork mini» is both flattering and flirtatious. Babydoll mini with a modified v-neckline. Plissé patchwork creates a dramatic signature volume utilising various tulle techniques. Voluminous 60s A-line mini dress with 3D flower appliqué detailing. The back features signature bow detailing. Playful 60s inspired mini dress with a fitted front bodice and flared back. The bodice is adorned with a 3D couture flower. Finally, for the girl that absolutely loves pants, the sculptural pantsuit is the de rigueur choice. Pantsuit featuring a draped bodice with a signature wrapped bow and voluminous pant legs with graphic pleats. 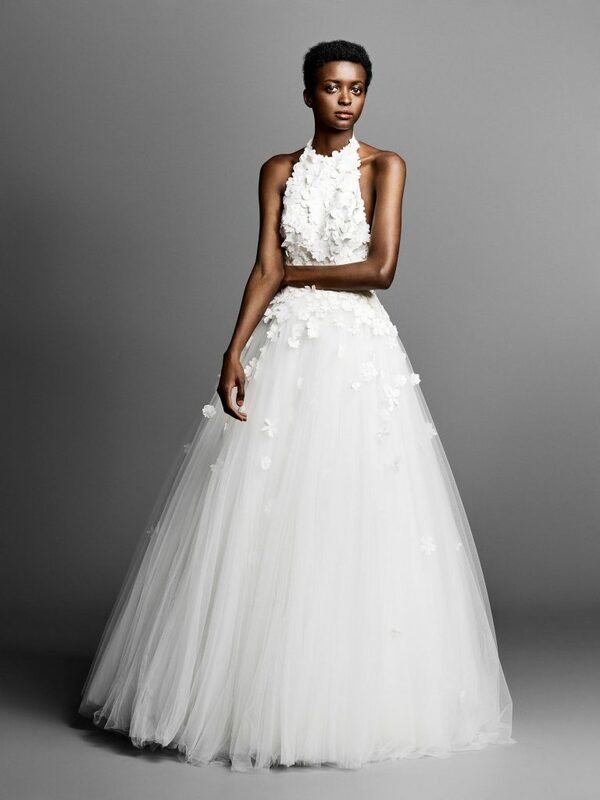 The Viktor&Rolf Mariage Collection is produced in collaboration with Justin Alexander, an award-winning designer under five labels (Justin Alexander, Justin Alexander Signature, Lillian West, Sincerity Bridal, Sweetheart Gowns).